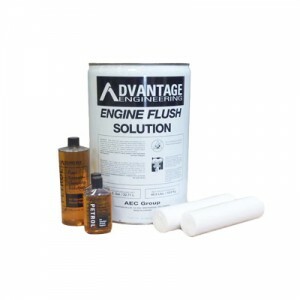 Advantage Engineering Engine Flush Solution is designed specifically for our static engine flushing equipment. High in detergents and dispersants, Advantage Engineering Engine Flush Solution is effective at dissolving and suspending contaminants which build up in your engine’s crankcase. These contaminants are effectively removed during the engine flush process with ultra fine filtration (down to 1 micron on some models). Advantage Engineering Engine Flush Solution is not a solvent. Formulated with an oil base, sufficient lubricity remains on all bearing surfaces to eliminate problems associated with dry starts. Advantage Engineering Premium Diesel Fuel System Cleaning Solution is formulated with high flash point technologies to effectively breakdown soft carbon, contaminant, and varnish accumulations that build-up in the manifold, valve, piston, and combustion areas. Periodic removal of these harmful fuel byproducts restore performance, reduce emissions, and prolong engine life. Advantage Engineering Filters are absolute, non-bypass, in design to trap and remove the smallest of contaminants (down to 1 micron on some models) which can build up and compromise your fluid system with additional restriction and friction. Advantage Engineering Premium Petrol Fuel System Cleaning Solution is formulated with high flash point technologies to effectively break down soft carbon, contaminant, and varnish accumulations that build up in the manifold, valve, piston, and combustion areas. Periodic removal of these combustion byproducts restore performance, reduce fuel consumption, and increase engine life.